BaSYS is our main product. BaSYS is a modular, scalable Network Information System (NIS) specialized in the planning and administration of technical pipeline information. The main focus lies in the areas of sewerage, water and gas systems. BaSYS accompanies the entire network management workflow; it supports all process steps from the collection of technical data, their technical classification and evaluation, to the calculation, design, optimization and rehabilitation of the network. BaSYS offers solutions for the planning of the operation and maintenance of plants, the evaluation of net assets and the administration of adjacent owners (indirect discharge cataster). BaSYS offers different user interfaces with different functions allowing the same database to be used by specialists as well as normal users. Malte Halbey-Martin works as a supporter and software trainer for Barthauer Software GmbH (Germany).The Company has just released the new version of its advanced Network Information System BaSYS (Version 9) for the efficient planning and management of potable or sewage water Systems, Natural Gas and Data Cables. An efficient and sustained management of sewer or fresh water systems is a significant task. Any problems with these systems can mean tremendous financial risk for owners and operators of these systems. Such problems can also present large environmental risks. To mitigate such risks a comprehensive application software is needed that can maintain such sewer and fresh water networks. Barthauer Software GmbH has released the new version of its network information system (BaSYS Version 9) that fulfils major network management requirements. This company has a high level of competency in designing network information systems due to over 25 years of experience in this field. The BaSYS software can be used in a wide range of application areas from planning and managing a sewage or tap water system to hydrodynamic modelling of these networks. The core of the BaSYS system is the project database, that can be hosted either on Oracle (11.1-12.1) or Microsoft SQL Server (SQL Server 2008 / SQL Server 2008 R2 / SQL Server 2012 and SQL Server 2014). The database contains all relevant network objects including geometrical components as well as further information such as normative libraries or userdefined lists. In BaSYS several modules are designed around this database. Due to this approach of storing relevant information in the central database, the network objects do not need geometrical components if no calculations are performed that require geometric information as input parameters and no graphical presentation of the network is needed. The data inside the project database can be explored by standard software like Microsoft Access without any restrictions. The content is not encoded by any proprietary algorithms following the business principals of the Barthauer company. Therefore, the system offers a large degree of openness in using it and managing user data. Beside other standards BaSYS fully supports the European DIN-EN 13508 covering drain and sewer systems external to any buildings. A variety of modules for managing the networks exist in BaSYS. Below is an overview of these modules that can be licensed according the user requirements. For managing the databases, the System Manager offers many functions that include comparison of databases and even the reorganisation of existing databases to increase database performance. All user defined settings are created in the Configuration Explorer. The most important parts of the Configuration Explorer are the Model Designer used to create central layout specifications for the graphical frontends and the Query Designer that helps the user to create own SQL queries to extract or maintain the data in the BaSYS project database. In Configuration Explorer many helpful documents are already implemented that can serve as templates for user defined configurations. In addition, a tool for the design of reports is incorporated; also, cross sections of pipes can be defined. Once created, these definitions are accessible in every BaSYS project database. These definitions can be exported in an XML file and passed to another user. The numerical data management is done in the KanDATA (for sewage networks) and AquaDATA (for tap water networks). For data input and output a variety of interfaces for different file formats are offered (e.g. German ISYBAU, Shape Export and ASCII Import / Export). Further, there are modules for automatic classification of the state of a sewage network or calculation of the hydrodynamic properties of fresh or sewage networks. For sewage networks there is a module for planning sanitation of damaged pipe systems (PISA) and asset validation of waste or fresh water networks as well (UniWert SQL which is TÜV approved; TÜV Germany is an independent agency for testing and assemenent of services). Also, a version for Personal Digital Assistants (PDA) for the field inventory of network objects like manholes exists (BaSYS mobile), that can be synchronized with the BaSYS database. This modular design results in a high scalability of the system. It can be used as an expert system or as a simple information station as well. Data can be accessed or modified by using one of the several graphic frontends. 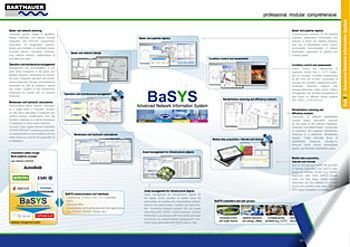 One of the outstanding features of BaSYS is the fact, that it can be used with all major CAD and GIS software systems. BaSYS can be used with ESRI ArcGIS (BaSYS Plan E), Autodesk AutoCAD (BaSYS Plan A), Bentley Microstation (BaSYS Plan B) as well as Intergraph Geomedia (BaSYS Plan I), Bricsys BricsCAD, AKG Vestra CAD, SynerGIS GeoOffice and QGIS. The datasets can be viewed by the BaSYS Visor, a viewer for the objects within the project database. A unified user interface for all graphic frontends provides the user with all functions necessary for planning or visualization of a sewage or tap water network. The different objects of the network have their own geometry that is stored inside the BaSYS project database. The frontends can be used to view or modify the data; the changes are written to the database directly. The attributes of different geometric objects can be viewed inside the graphical frontend via the BaSYS object info. If attributes of BaSYS objects are changed via the object info in BaSYS plan, the graphic visualization of the objects is synchronized automatically. The objects can be selected graphically and passed to other modules like KanDATA or AquaDATA for further modifications. This is done by the BaSYS Synchronizer, a tool for passing network objects to other BaSYS modules. Especially for planning of a network system this function offers an efficient way to switch between several BaSYS applications. During the construction of the plan the heights of the objects like manholes can be derived from measurement points or existing digital elevation models. In BaSYS Plan A the network objects can be directly derived from existing graphic objects in an existing AutoCAD drawing and are stored in the BaSYS project database. In ArcGIS, the objects are created as feature datasets from the entries in the BaSYS project database. These features can be stored in an independent geo-database or in an ArcSDE and synchronized with the data in the BaSYS project database. When modifications to these objects are done, the corresponding features are rebuilt, so that the ESRI features are in the same state as the objects into the BaSYS project database. The graphical objects or features in several graphic systems can then be used for further work outside of BaSYS. Model designer is the central tool for layout definition of BaSYS objects for presentation of the data in a map. Here, the style, visibility and values are defined depending on the objects and what should be visualized in the plan. This enables the user to create individual layouts for the network maps with innumerable possibilities. These definitions can be based on the attributes in the database. This central definition makes it possible to create almost an identical look of the objects in the different graphical systems. Some limitations apply due to different philosophies of the underlying GIS / CAD software). The position of text elements of Network objects can be stored in the field containing their geometries into the BaSYS project database. Therefore, every text position can be passed between various graphical frontends. When building a map different GIS or CAD objects are derived from this geometry which makes BaSYS independent of the CAD or GIS system used. Cadastral maps or orthophotos can be used as background information in the graphical frontends together with the network information out of the BaSYS project database to create meaningful maps. BaSYS can serve as a pure information system as well. In this mode, no editing of the data inside the project database can be done. This can be either run on a workstation or through a Web-Frontend. For the numerical data, the Web Spectator acts as a data reader. In combination with a WebGIS application for the visualization of networks it is possible to switch the graphic view of the objects and the Spectator for viewing the numerical data on different objects. Several WebGIS platforms are supported such as ArcIMS or MapGUIDE. BaSYS covers functions to manage or plan tap or sewage water networks. Also, due to the modular design it offers a high scalability so it can be licensed according to user requirements. Another advantage is that it can be used with all major relational database management systems. Due to the philosophy that the data of the objects must be accessible without any restrictions the user has full control of the data. The most outstanding feature is the possibility to use different graphic frontends. The central definition of the layout for the making of network maps gives the opportunity to create the layout for example in Autodesk AutoCAD including the text position of the attributes of the data; and this layout is almost identical in other graphic systems which will lead to more convergence between CAD and GIS software.